Kate and Shawn were married September 7th, 2013. 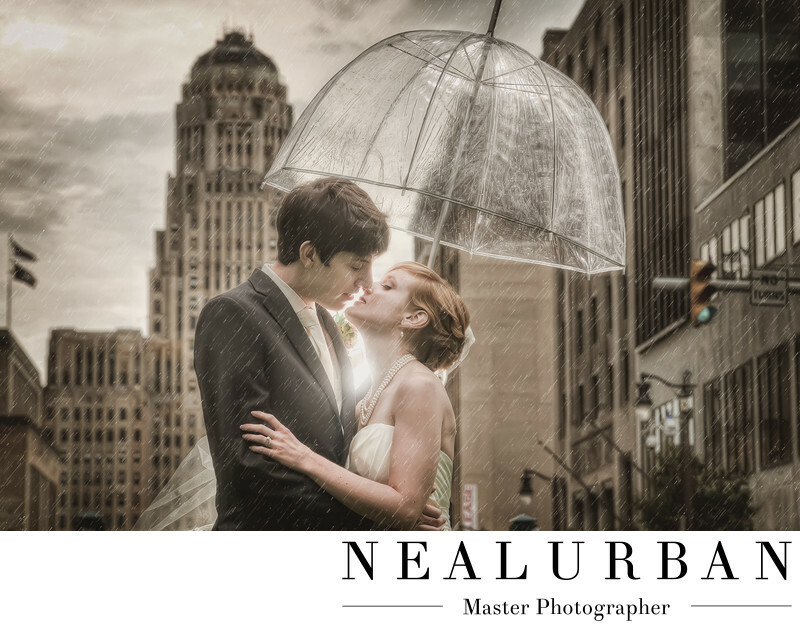 They had a bit of a gloomy day, but the images were still amazing! They had their wedding at Hotel at the Lafayette in downtown Buffalo. This image was taken at Lafayette Square, which is right across the street from the venue. We loved this angle because you could see right down to City Hall. That is always a fan favorite location to shoot at, so it was nice to get a different take on it! After working with the bridesmaids and groomsmen, we sent them over to the hotel and worked with the bride and groom. We always try to remember to have umbrellas in the car. Let's be honest, we have to bring a lot of gear, so sometimes that slips our minds. Not for Kate and Shawn's wedding! We even remembered the clear umbrellas! For this, we had some assistance from the bride on lighting. We had Shawn holding the umbrella over himself and his lovely wife. Then Kate was holding a light behind them. We wanted a little bit of a glow behind them them. When going through the images we really liked this one the best and how the light was not filling up the umbrella too bright. The light was a little lower. The happy couple is almost kissing! When they did have a kiss, we lost the effect with the light. That sometimes happens. When we are going for something artistic to showcase we may go with an image like this. The couple will still receive the rest in their gallery though. The City Hall back drop is awesome too! Buffalo architecture is amazing! It's always so nice to have it in photos. The flags on the left hand side look really good too. That was a nice touch and I am glad they weren't cropped out! Location: 415 Main St Buffalo NY 14203 United States.